Kellogg School Dean Dipak C. Jain has recommitted Kellogg to building its alumni network and increasing the relationship between Kellogg and its graduates. To help meet that objective, the Kellogg Office of Development created a new position — director of planned and major gifts. 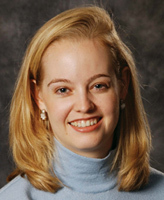 Stephanie Blackburn Freeth ’02 joined the Kellogg team in that role last summer. Kellogg World discussed her new role in a recent interview. Describe your responsibilities in the Kellogg Office of Development. As director of planned and major gifts, I connect with alumni and match the school’s needs with alumni support. I travel with Dean Jain, orchestrating individual meetings, small group lunches, and other special events. This really is an exciting time for external relations at Kellogg, given Dean Jain’s renewed emphasis on engaging alumni all over the world. Why did you decide to pursue a career in fund raising for Kellogg following your graduation from the school last June? I grew up in a family of educators, so I have always valued education as fundamentally important to success. I am thankful for the liberal arts perspective that I gained as an English major at Princeton, and am extremely grateful to Kellogg for providing me with a solid understanding of management and business principles. In deciding to pursue a career as a fund-raiser for Kellogg as my first job after business school, I knew I would be able to give back immediately to an institution that has given me such a firm foundation. Why should alumni and friends of Kellogg give back to the school? While tuition covers a percentage of Kellogg’s operating needs, there is still a large part of the budget that depends upon alumni support. Kellogg has had a great impact on the lives of so many alumni through the years, and we hope that these alumni will consider supporting Kellogg when they decide which nonprofits to support with their charitable giving. What are Kellogg’s current fund-raising priorities? Contributions to the Annual Fund are always welcome at any amount. We also seek substantial funding for student scholarships, faculty chairs, research support and facilities improvement. A key activity from now until the end of the fiscal year (Aug. 31) is support of Campaign Northwestern, the university’s major fund-raising initiative. While this campaign has reached its $1.4 billion goal ahead of schedule, there is a push to reach $1.5 billion by the end of the fiscal year. Kellogg’s alumni and friends can be a part of that tremendous accomplishment. Describe some of the ways people can make gifts to Kellogg. Gifts to the Annual Fund, for example, are intended for immediate use. These contributions are often made in the form of cash, checks, credit card payments or appreciated securities. Those interested in supporting the longer-term needs of the school can do so in the form of bequests and other planned giving vehicles such as charitable gifts annuities, remainder trusts, insurance and pooled income funds. These plans provide a return to donors and their families for a specific duration of time, with either the principal or interest given to Kellogg. If you are interested in making a major gift to the Kellogg School, please contact Stephanie Freeth via email or at 847-491-3348.